In case you haven’t noticed, I love my mom. A lot. I’ll be totally honest here, she’s my best friend. We never went through that awkward mother-daughter phase where I rebelled and we fought and then made up when I finally got old enough that I realized she did know what she was talking about. We just didn’t – we got along and stayed getting along all the time that I was growing up. Truth. Bottom line: when she says something or passes something along to me, I usually listen or take note. Not always, but mostly. Because it’s usually good advice. Recently she passed along this recipe, and it didn’t disappoint. Ever since I moved away from home to go to university (that sounds so British doesn’t it? Trust me – not a bit of Brit here – just a girl from the midwest who moved to the southeast for college), anyway, since I moved, my mom and I have still kept in close touch. We talk on the phone at least once a week, I go home to St. Louis for Thanksgiving, Christmas and my birthday like clockwork, we save things for each other to mail (news clippings, cards, notes, stuff that the other would find useful or just for fun AND recipes) in between visits. Lately, we’ve emailed more recipes back and forth to each other than mailed, but you get the idea. So a while back, she shared a recipe with me for an Asian marinade or glaze, call it what you will, and when I gave it a try myself, I was impressed. Sometimes chicken can dry or get tough when it’s being grilled, but this Asian marinade makes it juicy, tender and full of flavor. It’s a ridiculously easy-to-slap-together marinade and you can let the chicken (or pork) soak overnight or just all day while you’re at work, before firing up the grill and making some beautifully browned Asian glazed chicken breasts. I put these alongside (and later on top of) my ultimate go-to salad, but you could put any veggie, rice or anything else with this chicken. It’s versatile and tastes good with everything, not to mention it’s low-fat, lower sodium and high protein. Enjoy! Whisk together the soy sauce, sesame oil, brown sugar, Worcestershire sauce, lemon juice, garlic, mustard and pepper. Put chicken breasts in a zip top freezer bag and pour in marinade. Seal bag and turn to coat until chicken is completely covered. Let sit in marinade overnight, for up to one day. 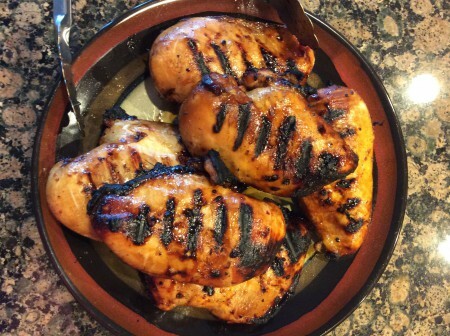 Heat grill to medium-high, and discard marinade once chicken is on grill. Cook for 6 minutes per side,, turning once. Let chicken rest for 5 minutes after it’s taken off the grill. Here’s the finished product – just pick a piece and you’re ready for dinner. 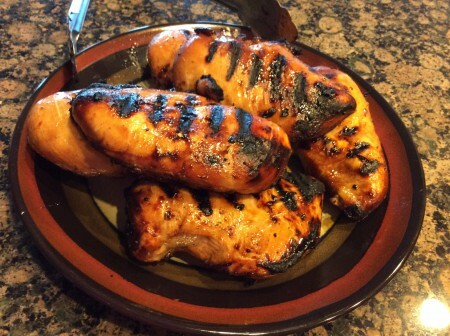 This entry was posted in Entrees, Recipes and tagged Asian, Asian Glaze, Asian Marinade, Chicken, Entrees, Glaze, Glazed, Glazed Chicken, Grill, Grilled Chicken, Low-fat, Marinade, Recipes on September 17, 2014 by Paige N.. Thanks! It really is – and shockingly easy to make too.